In the beginning, Mesopotamia's ruler was called an “en.” The en served as a high priest or god's representative on earth. The en also was the political or secular(non-religious) authority. After much time, the population grew and there emerged a need for a larger government. Before long, the office of governor was added, and they called him a ensi. At this time, the ensi was in charge of the military, commerce, trade, law and order, all religious rituals, and the management of temple lands. During times of attack or special needs, the Mesopotamians were known to elect a “great man,” or “lugal” who would serve long enough to lead them out of the impending disaster. However, if the crisis continued then the lugal might have become a permanent leader. In this case he would have to claim that he had been chosen by heaven, and he would have had to have support from from the highest priest from the temple of the god Enlil at Nippur. Most of what we know about the Mesopotamian social structure we know from Hammurabi's Laws. Hammurabi was the sixth king of Babylon (1792-1750B.C. ), and he is credited with uniting all of Mesopotamia. Hammurabi's Code or Laws tell us that three types of people lived in Mesopotamian society. At the top were the awilum, and they were the landowners. Next came the citizens who were free but did not own land. They were called mushkenum, or plebian. Last were those who did not own land and were slaves. This level of society was called wardum. However, the structure was not rigid. The Mesopotamian's allowed for movement between the classes. For example, if you managed to purchase land, or if you married a member of a higher class, the children that you bore would belong to the higher class. On the other hand, if you were deeply in debt you could lose your freedom and become a wardum. At the same time, slaves were sometimes granted freedom, and at that time they would become mushkenum. The king was considered to be the representative of the sky-god Anu on earth. His chief divine responsibility was to maintain order by enacting laws, issuing decrees, and making sure that they were enforced. 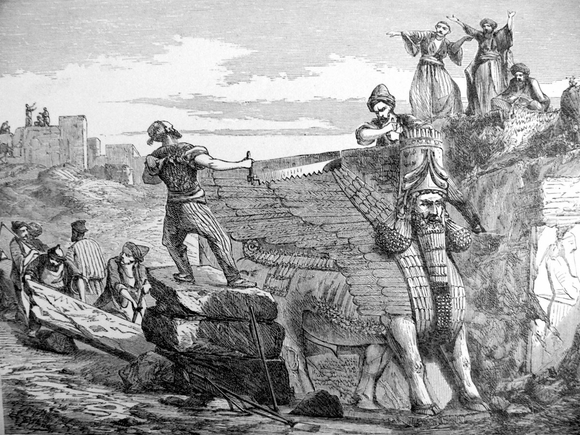 Mesopotamians did not believe in punishing people by putting them in jail. Instead they inflicted corporal punishment. The king also guided the justice system, directed the military, and participated in religious ceremonies. The kings also managed their lucrative royal land holdings. The majority of land in Mesopotamia was owned by the king and the church, and they benefited from the money that the land produced. The king was assisted by hierarchy of the temple priests, a court system that administered the laws, a commander-in-chief, a chief of staff, a prime minister, a multitude of servants, and a large number of scribes. As the empire grew the Mesopotamian's added governors and royal messengers to transmit communications as they were needed. Mesopotamian's paid taxes in the form of services and goods. Usually, they would be required to give a percentage of that they had produced. The payment was usually in the form of livestock, grain, fish, wool, or silver. They could also serve in the military, work on a communal project such as temple construction, or assist in the planting and harvesting of communal land. As the population grew the government was also forced to hire more and more civil servants to collect taxes.